Photo of the Cascade Mansion and Gardens, located on Dodson Drive in SW Atlanta on the former "East Point Road" During the Military operations against Atlanta in the Summer of 1864. 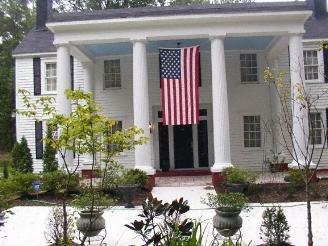 The Antebellum Cascade Mansion was constructed by the son in law if Atlanta's First Physician, Dr. Joshua Gilbert. Dr William Poole married the daughter Elizabeth of Dr Gilbert and the couple began the construction of their home in 1860. Dr. Poole left the newly established Atlanta Medical College to become a Confederate Surgeon. He served the 57th Georgia Infantry Regiment and later returned to Atlanta in 1863 as an Assitant Surgeon. He and his wife Elizabeth Poole completed the house after the war. It was incorrectly reported in Union Army reports as the "Head House" and served briefly as the Headquarters of Confederated Major General William B. Bate August 5-6, 1864. Previously the home of Mrs. Dixie Stevens, proponent of the restoration of the Fox Theater in 1970 and is currently the residence of Lieutenant Colonel Bennett an Army Historian. The home has five working fireplaces, five bedrooms and beautiful gardens and has been operated as a Bed and Breakfast Inn supporting tours of the Atlanta Campaign of the Civil war and Siege of Atlanta.